About the Translator: Sri Lohitakshya Joshi teaches English language and literature at K.V. College, Kantabanji in the district of Bolangir. He has published many research articles and presented research papers. He has also undertaken various state and national level studies on education and other socio-economic issues. He also works on the issue of migration hitting western Odisha very badly. Dr. Sanjaya Kumar Mishra, popularly known as the poet of the masses is also a very good novelist. He writes on the plight and pathos of the people living at the grass root. There is a strong undercurrent of a clarion call for social justice and equity in all his writings. He has written five books of poetry and one book of short story. His maiden novel Dadan Sundari claimed immediate approval and huge appreciation from the readers and critics. This book has already been translated into Hindi by the noted writer Padmashree Dr. Srinivas Udgata. 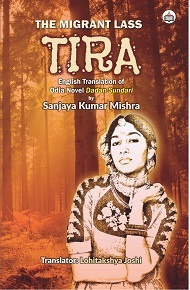 In The Migrant Lass: Tira(DadanSundari) he has highlighted a very emergent issue of distress migration and its inner dynamics leading to the exploitation of the poor labourers. The storyline and the characters touch the sensibility of everyone in our society.